This exquisite antique clock set is creative in its use of Neoclassical motifs and contrasting materials, combining smooth white onyx with shining gold ormolu. 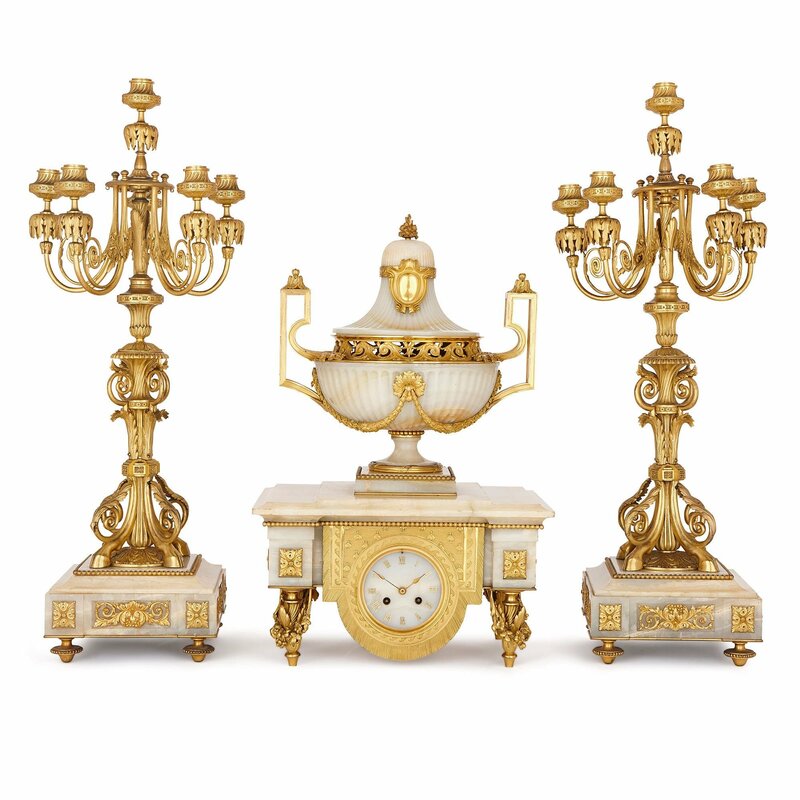 This set consists of a central clock, flanked by two candelabra. In its style, the set draws on classical motifs, and employs them in an innovative, 19th Century revival way, typical of the Napoleon III period when it was created. 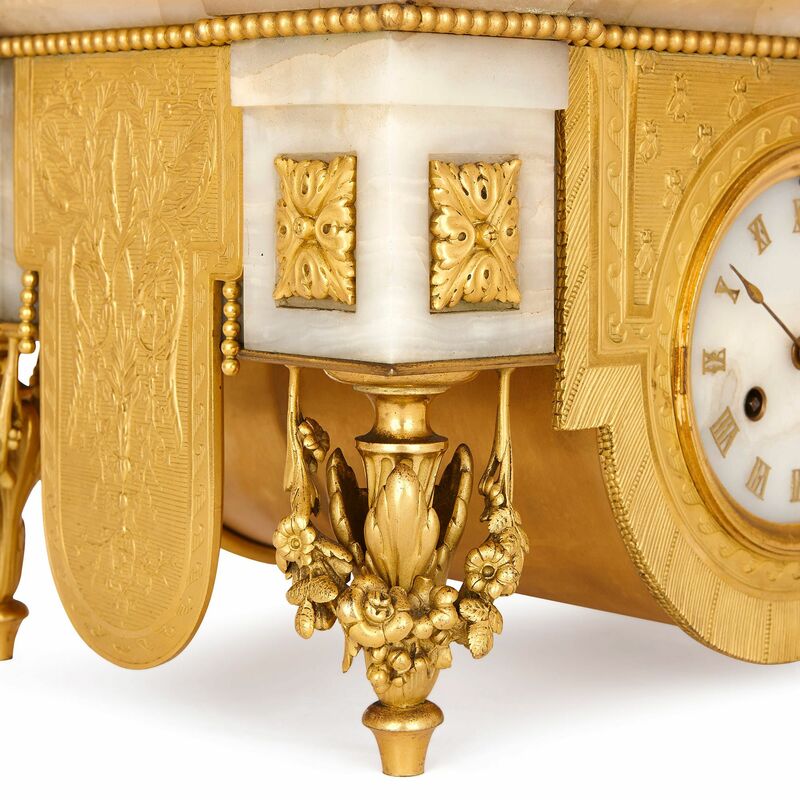 The central clock is formed with a rectangular white onyx body, which stands on four ormolu, leafy turned feet, with flower garlands wrapped around them. The onyx body is stepped, and the four corner blocks above the legs project outwards, and are mounted with ormolu, square, foliate motifs. At the centre of the onyx body, there is the circular clock dial. 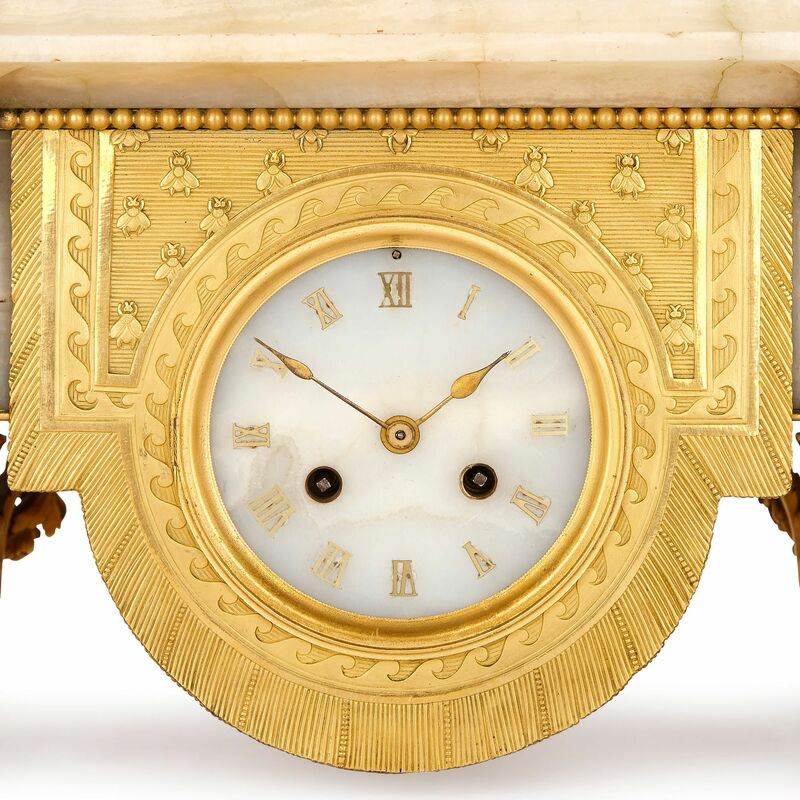 This has an onyx face, and is decorated with gilt Roman Numerals and slender ormolu clock hands. The circular dial is set within a part-rectangular part-circular ormolu case, decorated with a wave-like border, relief depictions of bees, and an incised edge. The sides of the onyx block are similarly mounted with ornamental ormolu panels, while the top edge of the block is articulated by a line of ormolu beading. 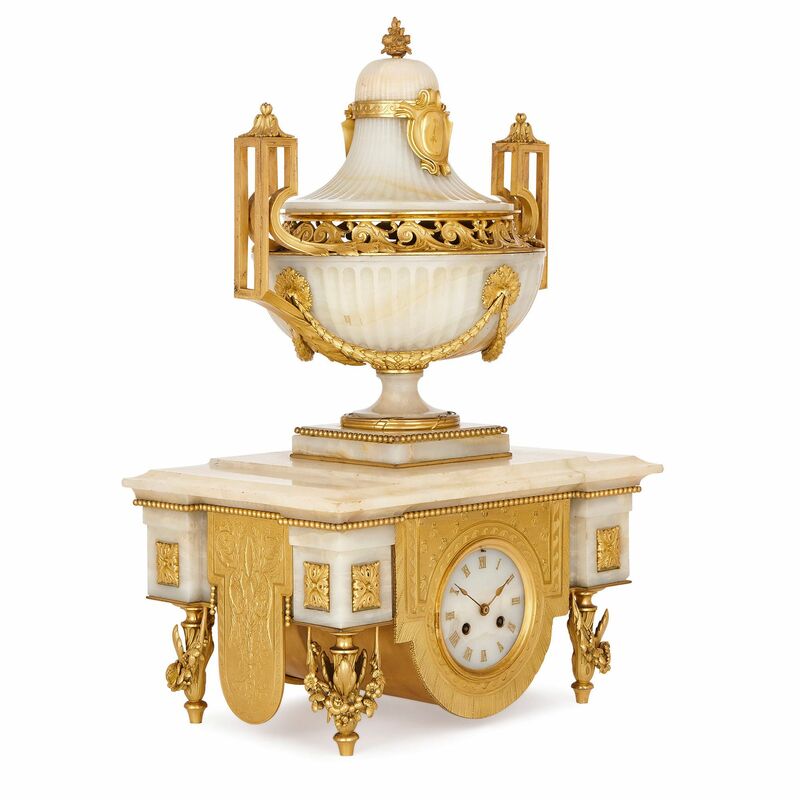 Above, the onyx clock body steps upwards, and is topped by an onyx lidded tazza. The tazza stands on a square, ormolu-beaded onyx plinth, and has a fluted onyx body mounted with an ormolu, laurel leaf swag. It is fitted with two ormolu geometric handles, has a pierced scrolling, foliate frieze, and is topped by a fluted onyx lid, mounted with an ormolu medallion and foliate finial. 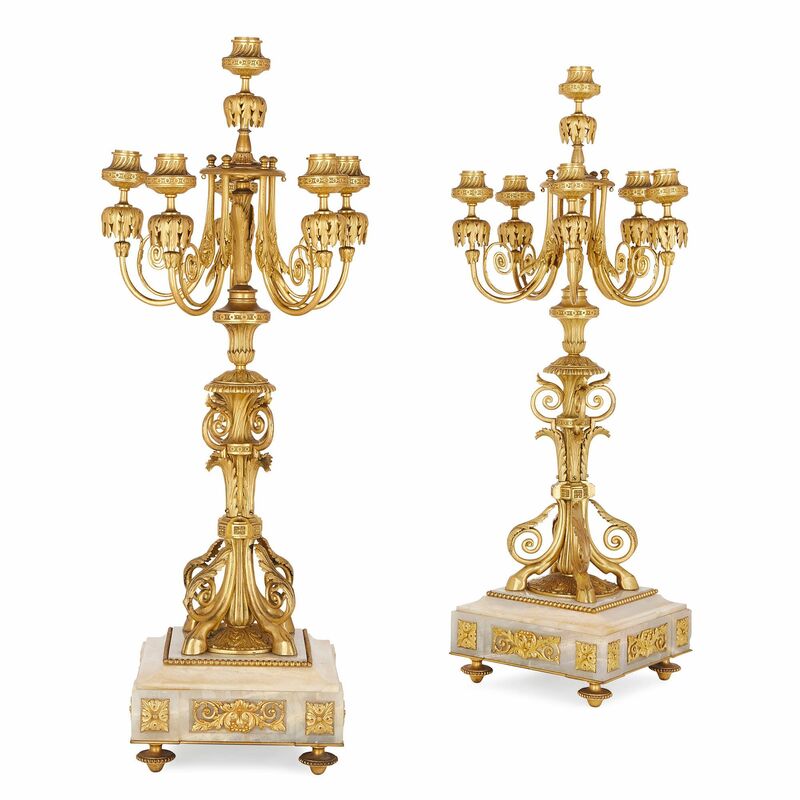 The pair of flanking candelabra stand on square onyx plinths, decorated with ormolu fruiting vines and beading, and each set on four ormolu toupie feet. 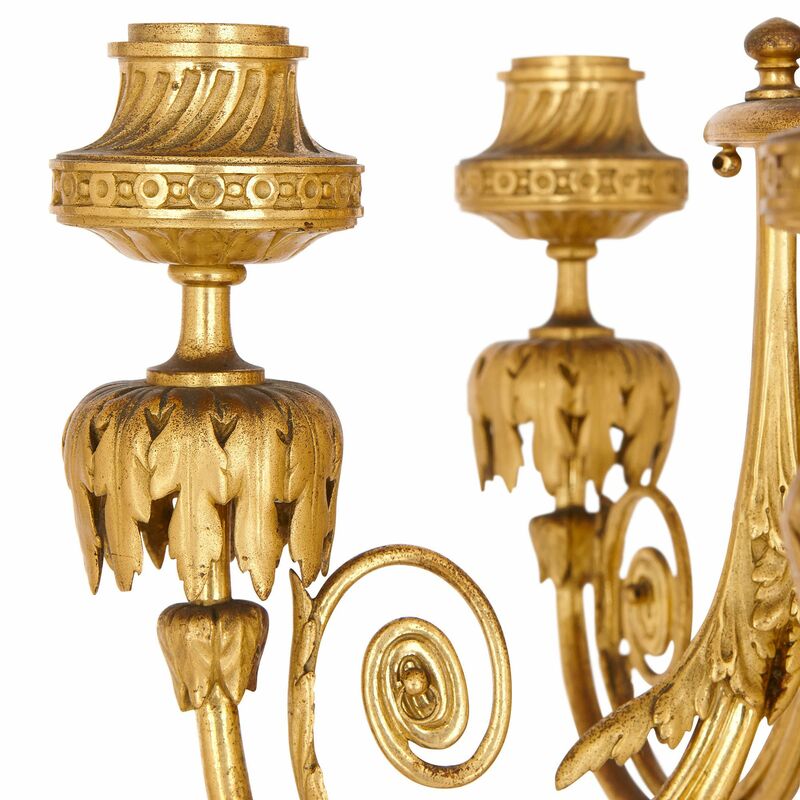 The ormolu candelabra feet are cast as hooves, which extend upwards in a shaped and fluted stem, that is entwined with scrolling vines. Each candelabrum has six arms, five encircling the stem and one topping it. These arms feature down-turned, acanthus leaf drip-pans, and fluted capitals.